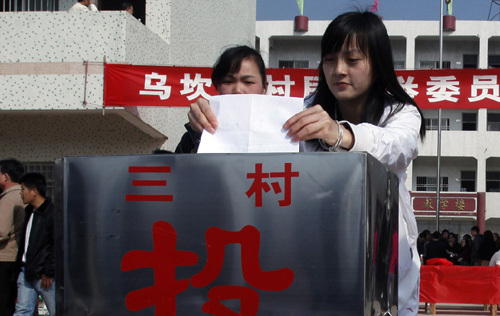 Feb.1 was the Election Day for Wukan Village in Lufeng, Guangdong. Among the 7,800 villagers 18 years old or above who are eligible to vote, 7688 cast their ballots. The election produced the 11-member Wukan Village Election Committee. There were two proposed systems for the election of Wukan Village Election Committee: electing committee members through villager representative meetings or through a direct vote by villagers aged 18 or older. Faced with this choice, Wukan villagers opted for the second path, proving that farmers could indeed handle local democratic participation. Last year, Wukan villagers launched months of large-scale protests against local authorities over issues related to land use, financing and political representation. Following these social conflicts, this month's election represented an innovation in local governance. Wukan's problems, however, are not unique — they reflect common issues facing the Chinese countryside. Land disputes, financial difficulties and labor instability have the potential to cause social disorder in rural areas across the country. Undoubtedly with economic development and the advancement of urbanization, more and more conflicts have emerged, causing major headaches for local authorities. The proliferation of social unrest in Wukan reflected a lack of solutions and outdated governance. The practice of ignoring farmers' interests in dealing with conflicts and denying reasonable appeals of people involved in social disputes proved not to resolve issues, but rather exacerbate tensions, proving that a lack of responsible governance only turns small conflicts into larger ones. The solution to Wukan issue is different from previous practices because it acknowledged common villagers' right to participate in local government. This right to participation is one of the basic rights of every citizen granted by the Constitution. With the direct elections of local representatives, Wukan villagers have endured last year's dark period of social unrest and have taken a crucial step towards democracy, setting a sound example for the potential of local governance. With the direct elections of local representatives, Wukan villagers have set a sound example for the potential of local governance.